Farmers are often faced with store vs. sell decisions. In this blog post, we walk through a real-life example of how farmers can benefit from storage hedge program. I’m going to walk through a series of hedge/storage decisions that one of our clients made on a sizable portion of their 2014 corn production. As always, past results are not indicative of future performance (also see the disclaimer at the end of this post) but this example is definitely not an outlier. 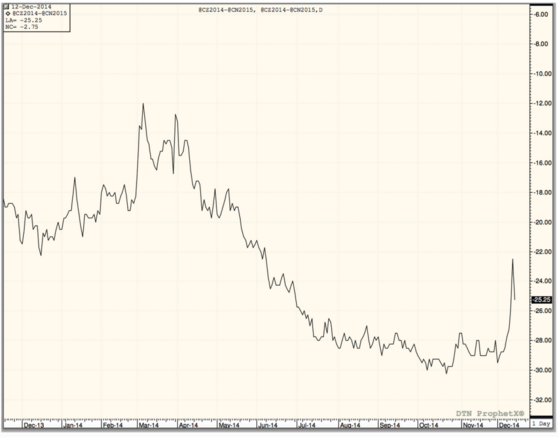 In May/June of 2014, December 2014 corn futures traded in a range from $4.50 to $5.00. On June 6, 2014 one of my clients locked in a $4.58 December futures price. Please keep in mind that this futures price was $.50+ off the high so I’m not cherrypicking a hedge that was perfectly executed in hindsight. This would’ve equated to a $3.88 cash price at their local corn buyer for harvest delivery. See below for cash bids from Hankinson Renewable Energy (Hankinson, ND) on that day. Note that this logic applies to nearly all geographies, not just ND. As the marketing year progressed, futures prices declined and the carry between Dec 2014 futures and deferred months proceeded to “widen out”. We decided to roll the futures hedge from December to July when the carry reached $.28/bu in August 2014 (with the benefit of hindsight we could’ve gotten as good as $.30 but we were happy w/ $.28). See below for a chart of the December 14/July 15 carry. Our plan was to deliver this corn in late July or August so we decided to roll once again from July futures to September futures and we did that for $.07/bu in January 2015. Let’s walk through and calculate what our final hedge price was. Our objective was to set the cash price if/when basis got to $.35 under the September 2015 futures. Our objective was met and we forward contracted our corn for August 2015 delivery and we simultaneously bought back our short futures contracts/hedges. Our net cash price ended up being $4.55 ($4.90 futures less $.35 basis). Now we need to compare this final cash price to the harvest cash price available to us when we first put on our futures hedge. If you look at the cash price grid above, you can see that it was $3.88. Wow! Gross storage return = $4.55 - $3.88 = $.67/bu! 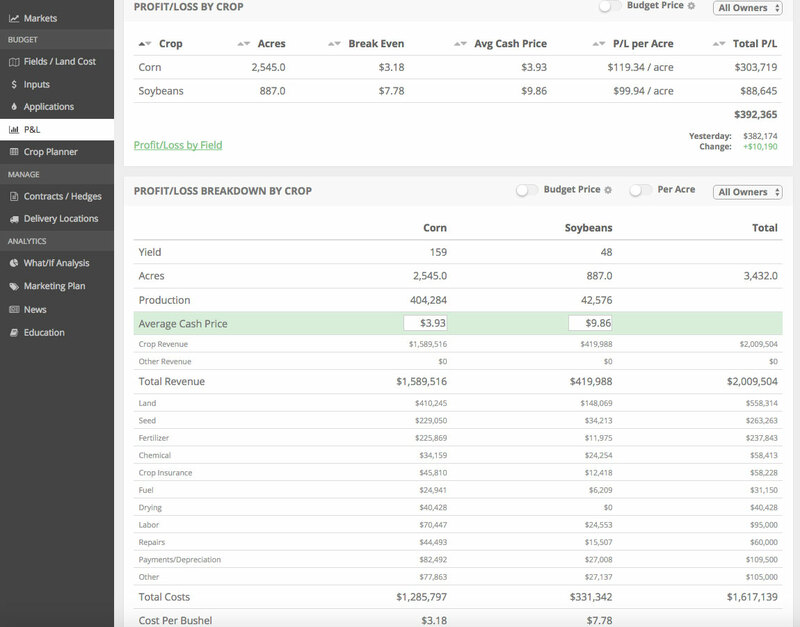 It’s likely that this producer’s net storage return was greater than $.50/bu even after fully burdening the gross return with interest, utility, and labor expenses. This type of return is not out of the ordinary. Note that once the futures hedge was put in place this return on storage is solely due to market carry and basis appreciation. We were not speculating on a post-harvest rally in the cash price which can happen but we chose not to take that risk with a fairly sizable portion of this producer’s production. In summary, if a mid-sized farmer (150k bu/year) implemented a storage hedge program over 20 years I’m confident that it would add over $1 million to their net worth. While great storage returns can be achieved on other crops, it’s arguably a bit more predictable on corn. That’s a discussion for another day. It’s easy to show these returns on paper but they take discipline in executing year-in/year-out. One feature of the software we’re going to release this fall is personalized storage hedge recommendations and tracking. If you’d like to try out a live demo of our software, click the button below. As always, shoot us an email or give us a call with any comments or questions. Disclaimer: The information contained herein was obtained from sources believed to be reliable, but can not be guaranteed. FC Stone may have contributed to this report. All examples given are strictly hypothetical and neither the information, nor any opinion expressed, constitutes a solicitation to market commodities or buy or sell futures or options on futures. Commodity marketing and trading is risky. Trading and/or marketing decisions and any trading and/or marketing gains or losses are the responsibility of the commodity owner, producer, and/or account holder. Harvest Profit, Inc., Midwest Hedging, LLC, and Market Wise Ag Services LLC, it’s principals, and employees assume no liability for any use of any information contained herein.